You'll seldom experience regret for anything that you've done. It is what you haven't done that will torment you. The message, therefore, is clear. Do it! 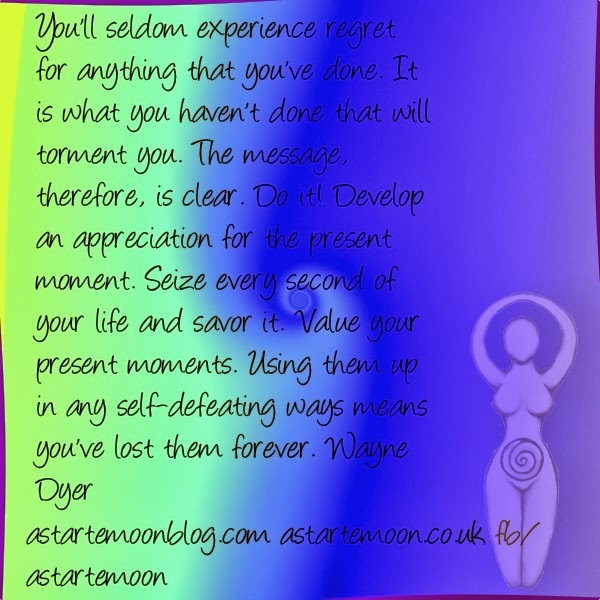 Develop an appreciation for the present moment. Seize every second of your life and savour it. Value your present moments. Using them up in any self-defeating ways means you've lost them forever. Enjoy today, there will never be another one quite like it! Value your present moments, each and everyone of them. I know I try to, it's not always easy on bad days but I can usually find many things to express gratitude for at the end of the day. Blessings of courage to you, Alison *´¯`•.¸¸.☽◯☾ *´¯`•.¸¸.